Oklahoma lawmakers have passed a bill that would make the state the first in the nation to allow the use of nitrogen gas as a back-up method to execute death-row prisoners. It’s unclear if Governor Mary Fallin (R) will sign the bill into law. When gas chambers were used previously in executions prisoners were asphyxiated using cyanide and there were reports of suffering. The use of nitrogen gas for executions would be novel and experimental. The bill, HB 1879, was approved in a 41-0 ballot and had already passed the House in March. The bill’s sponsor, Rep. Mike Christian (R), read about the nitrogen gas method in a 2014 Slate article. "If Oklahoma is a state that does executions, we can find a better, humane way to carry them out," Christian told the Huffington Post in March when the House passed the bill. Christian says that unlike traditional gas chambers that used drugs like cyanide, which cause a build-up of carbon dioxide in the blood, breathing nitrogen would be a painless death because it leads to hypoxia – a gradual lack of oxygen in the blood, similar to what can happen to pilots at high altitudes. Execution via ‘nitrogen hypoxia’ is a method advanced in the National Law Review paper in 2005 by Stuart A. Creque, which is seemingly based on the fatal outcomes of chemical accidents involving nitrogen. There do not seem to be any instances of nitrogen having being used in executions to date. The measure, if signed into law, would reinstate the gas chamber as a backup execution method to lethal injection. The state’s third execution method is death by firing squad, an option also introduced by Christian in 2014. 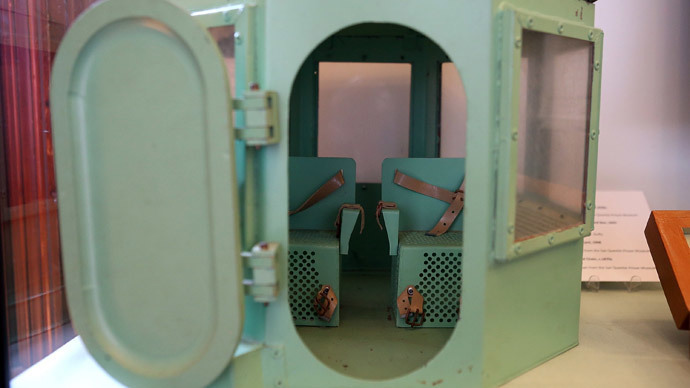 Three other states use the gas chamber as an alternative to lethal injection – Arizona, California and Mississippi – though they do not list nitrogen gas as the lethal chemical. The search for alternative execution methods comes during an upheaval in the manufacture of the drugs. A decade-old ban in the European Union prohibits EU nations from exporting execution drugs, and the subsequent shortage that it has spawned in the US has prompted prison officials to seek out compounding pharmacists to mix and develop new sorts of lethal injection cocktails. Three executions remain on hold in Oklahoma as the state’s three-drug cocktail is under review with the Supreme Court, which will determine whether the policy violates the Eighth Amendment’s protection against cruel and unusual punishment. The lawsuit was brought by four inmates, one of whom was subsequently executed in January. Before his death, Charles Warner declared that his “body was on fire” and “no one should go through this.” His death from lethal injection took 18 minutes. "It just goes to show you how hell-bent they are on killing people," Richard Glossip, a plaintiff in the lawsuit, which will be heard by the US Supreme Court later this month, told the Huffington Post. "If they can gas them, use lethal injection -- it should really scare everyone out there that they're so bent on this."